In the morning and early afternoon I gathered some of the quilts that will be shown at my guild presentation Monday night here in Sandwich, IL. 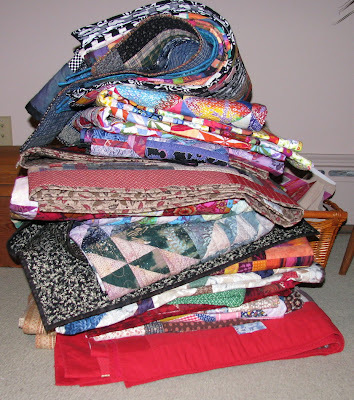 The topic is scrap quilts and I have 30 quilts piled up here. I have another 15 quilt tops on my list to show and talk about. In the afternoon and into the evening I sewed more triangles into squares, another 2.3 rows to be exact. I still haven't cut the rest of the triangles. I might get a chance later today after I teach a finishing class. Here is the backyard scene yesterday at lunch time: 2 sparrows on the feeder, a cardinal and a squirrel underneath. My garden is getting tall and lush. We got some heavy rain last night so I expect it will shoot up some more. There are some buds on my peonies on the right too. I thought they might bloom early with the hot weather we had in April but now we have had a cool week so they seem to be on their regular schedule of blooming near Memorial Day. I have about 35 peony bushes that bloom over a 3 week period. Oh, how I'd love to see your guild presentation!! 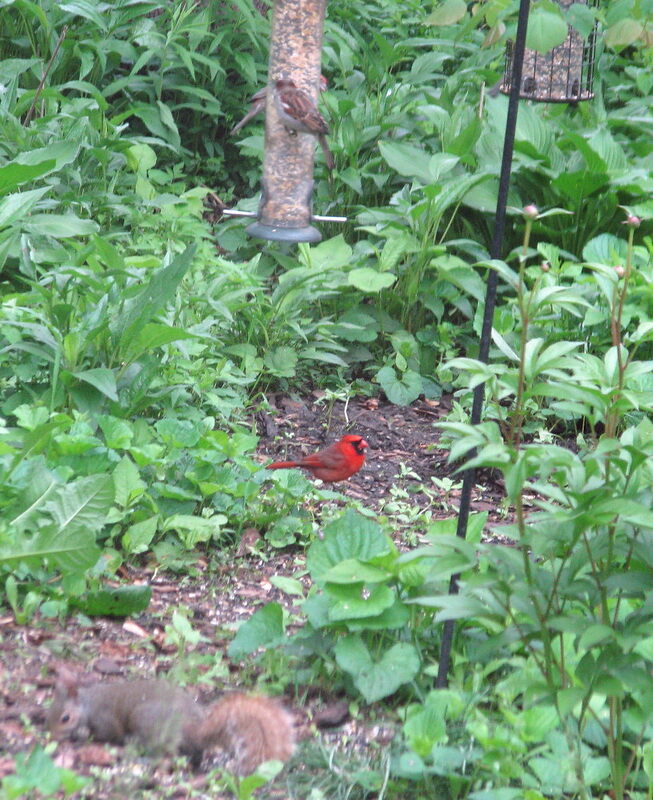 That cardinal stands out -- such brilliant colour in that shot! Wish I lived in Sandwich, IL. I would love to see all those quilts in real life! I would also love to see those 35 peony bushes when they bloom. Your garden is beautiful, getting all lush and green. 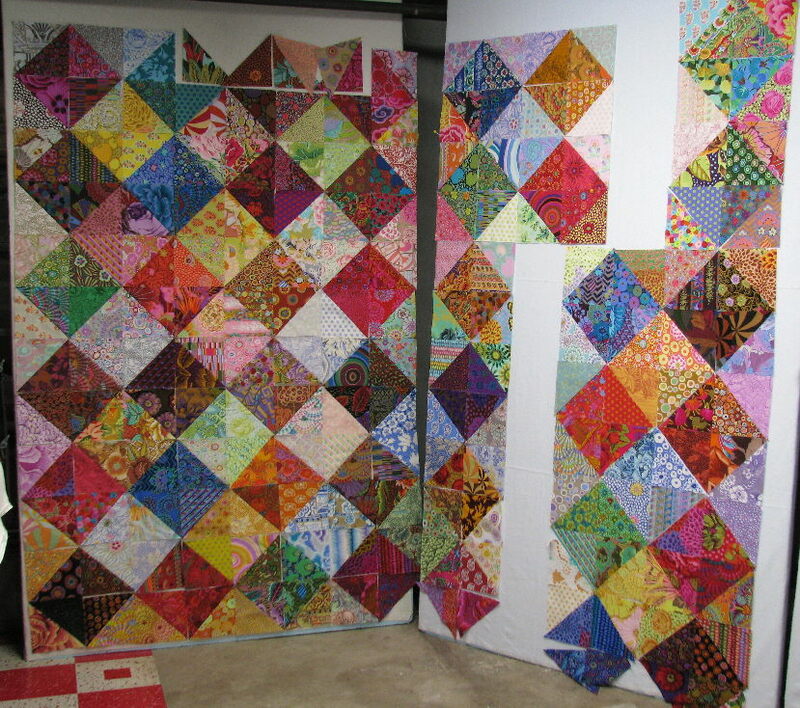 Wow - that's a lot of quilts! What a lucky guild!!! THIRTY FIVE peonies? Your yard must be a wonderland for those three weeks. Post pictures, please! THat will be one wonderful trunk show!! I wish I could be a fly on the wall. Quilts are always better in person. Your peonies are going to be just beautiful! 35 that is amazing. That's a big pile of wonderful color! Sandwich, IL is very lucky. What a lovely pile of quilts! 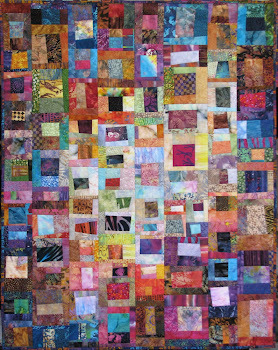 Can you believe how many quilts you have made? Sometimes when I think about how many I have made it boggles my mind. I love watching your process... Color guides you down a lovely satisfying path. Good luck with you guild show, I am sure you have tons of beauties to show. 35 peony bushes? I'm so jealous. My favourite garden flower. A very large garden to have 35 peonies! Love your quilts wish I could see them person! Wish I could be there for the quilt sharing. 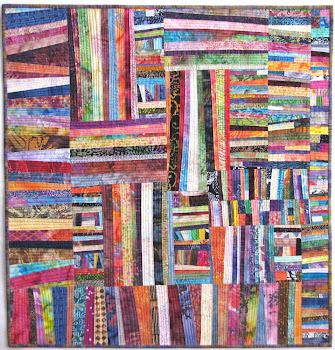 It sounds wonderful and I love scrap quilts. 35 peonies????? Oh my, how I would love to see them. Please be sure to share lots of pictures of them. It is one flower that we cannot grow here. Do you sleep???? LOL! Would love to be at the guild meeting - good luck :)! What a wonderful trunk show presentation ... someone needs to video it for you so you can share it long distance! I grew up with peonies ... wonderful flowers! Sadly, they don't grow in my yard here. That KF quilt is fabulous, btw! Me too ~ sure wish I could be there to see your presentation on Monday. Nice progress on your triangles . How you find time to do it all plus care of your Dad always tugs at my heart strings. And activity at your bird feeder. I had to enlarge that photo... could not believe the size of the violet leaves. But with all of your rain, no wonder you have such a tropical like garden. I can't wait to see your peonies. These were my great aunt and my mom's favorite. We still have the plants. My dad is going to bring me a cutting for my yard this summer so I can also have the "family peony" bloom. I was seriously intimidated this morning when I first saw this post, so had to wait till I got myself under control to leave a comment. :) Seriously - that's a LOT of quilts, but then I've seen the pictures you posted of your closet with all those hanging. You are a talented lady! I enjoy looking at all your quilts. And at all the life going on outside your home.